Well, after it cooled down a bit, and at last we got some rain (and thunder!) the heatwave has returned and we are all getting overcooked again. Mum says it's hardly ever this hot in England so there is something very wrong. The hottest summer she remembers is when she was a kid back in 1976. Of course, we do get some hot days here, but nothing like this nasty heatwave from Hades that goes on for weeks and weeks. If you're wondering what effect Mum used this week it's the same as last week, the watercolour effect in Photoshop Elements. Or enter any of your own art featuring animals! That is a lovely effect for you, Athena. My art is at the end of my Friday post. I agree about the hot weather. The cooler respite was all too short, although the welcome rain has made the grass less brown. What pretty art of you, Athena! The art is really lovely! I hope you cool down some! That came lovely. Love how your face is so clear and the rest is soft and blurry. I did my art on FB so I hope no one minds. Athena! Darling! Your water color is stunning! Glad it cooled down, if only for a bit. Hope that heatwave moves along quickly. Happy Caturday! We're over 100 degrees every day in summer here in Phoenix, Arizona. Not sure what our high temperature was so far this year. Maybe 117, something like that. Makes it very hard on the cats that live outside. We try to leave water for them. 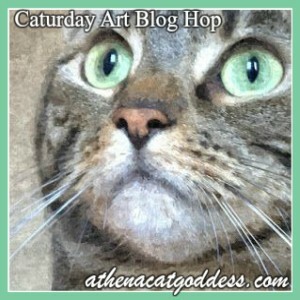 Oh that alone is such a lovely image of you Athena and makes a beautiful piece of art! We're sweltering in the northeastern US too...so, so sick of it. 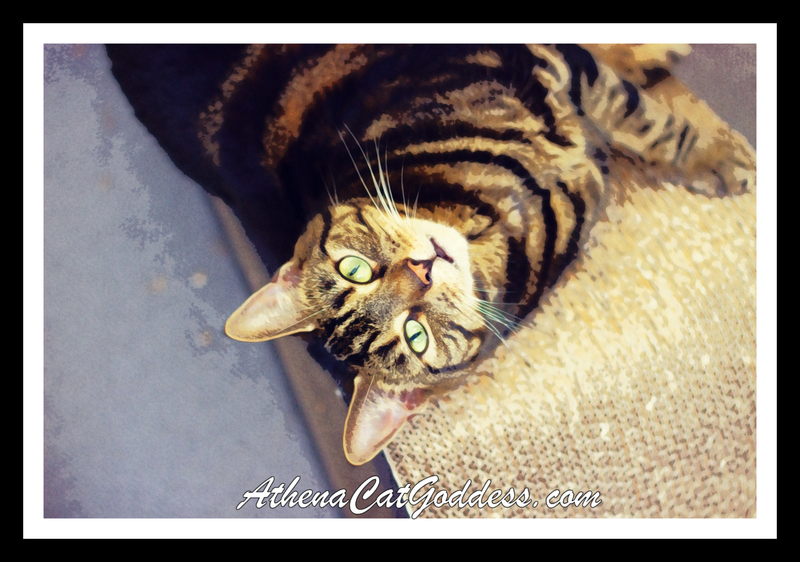 We're loving your arty-farty effect today Athena, epically gorgeous as always! You look most wonderful Athena! Beautiful artwork! We need to use Photoshop Elements more often. You look especially lovely in this photo, Athena. We hope it starts cooling off there soon. It sounds horrid! Could you get any more gorgeous, Athena? We don't think so.